, a learned English divine, was the son of a merchant in Exeter, and born there in 1579. After a proper education in classical literature, he was admitted of St. Alban’s-hall, in Oxford, in 1595, where he became so noted a disputant and orator, that he was unanimously elected fellow of Exeter college at two years standing. He then studied philosophy and divinity, and having received holy orders, travelled abroad. In 1610 he was admitted to the reading of the sentences, and in 1611 took his degrees in divinity. He was afterwards made chaplain to prince Charles, and archdeacon of Surrey, in 1616; but never rose to any higher dignity, on account of the zealous opposition he made to the match of the infanta of Spain with the prince his master. 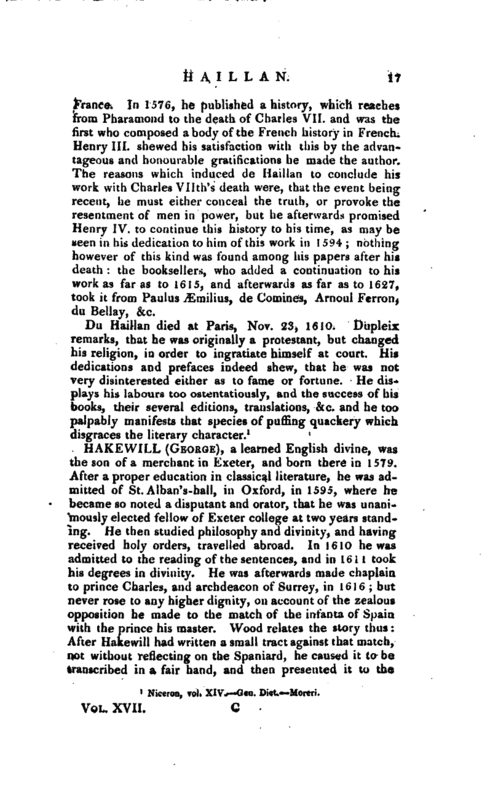 Wood relates the story thus: After Hakewill had written a small tract against that match, not without reflecting on the Spaniard, he caused it to be transcribed in a fair hand, and then presented it to the | prince. The prince perused it, and shewed it to the king; who, being highly offended at it, caused the author to be imprisoned, in August 1621; soon after which, being released, he was dismissed from his attendance on the prince. He was afterwards elected rector of Exeter college, but resided very little there, although he proved a liberal benefactor to the college; for, the civil war breaking out, he retired to his rectory of Heanton near Barnstaple in Devonshire, and there continued to the time of his death in 1649. He wrote several things, enumerated by Wood; but his principal work, and that for which he is most known, is “An Apology or Declaration of the Power and Providence of God in the Government of the World, proving that it doth not decay, &c.” in four books, 1627. To which were added two more in the third edition, 1635, in folio. Ath. Ox. vol. II. Walker’s. Sufferings of the Clergy. 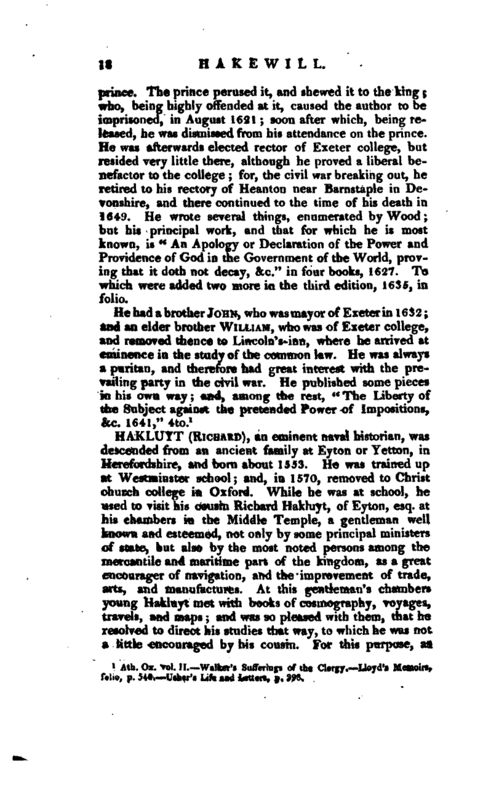 Lloyd’s Memoirs, folio, p. 540. Usher’s Life and Letters, p. 393.